A great conversation with psychotherapist Esther Perel, reflecting on a number of topics such as attitude to relationships, desire, love and dating. This is for everyone regardless of relationship status. Be sure to check out her YouTube page for tips and advice in her bite size videos. 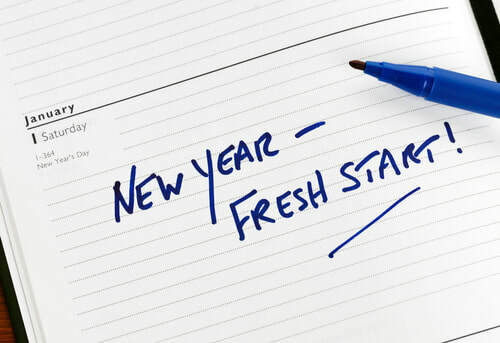 The New Year is a natural and popular time for renewed focus on personal development and desired life changes. Often intentions fail to materialise for a combination of reasons including lack of concrete plans and sustain application. 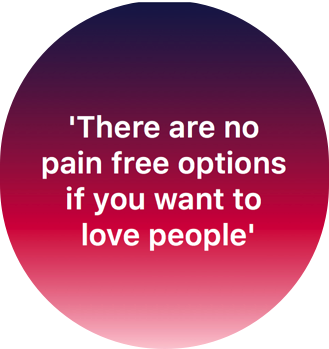 When it comes to counselling and psychotherapy, the desire for change, the desire to be happier, to be free from emotional pain requires an accompanying understanding and mind set of tolerance to emotional pain and discomfort. Whilst current life difficulties invariably result in distress such as depression and excessive anxiety, dealing with the causes of the distress also brings contact with denied and unprocessed feelings and emotions. This is also very difficult and can seeming overwhelming to even come near it which can be part of the reason for distress in the first place as coping mechanisms used to help people deal with the emotional pain unwittingly causes the intensity of the feelings or lack of feelings to build over time to the point that it becomes unsustainable. The healing aspect of therapy where experiences need to be processed means a different type of emotional pain and discomfort is encountered. With that it highlights the impasse people often get stuck between where the symptoms such as depression and OCD are down to the difficulty in dealing with the root causes of their distress such as death of a loved one or childhood trauma. 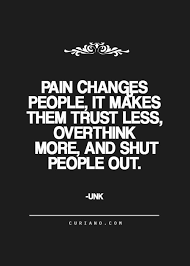 Faced with such a situation there is an understandable desire to be relieved from the pain and ironically therapy which is a space of healing can at first glance be seen as a space that doesn’t evoke refuge because it doesn’t represent a pain free option. Doing the work of dealing with a painful past means eventual contact with the pain carried from unprocessed feelings. This is one thing that needs to be highlighted more in that the work of healing as often it get worse in the short term before it gets better in the long term due to the process of facing up the past in all its persuasions including in no particular order - loss, shame, guilt, anger, sadness, mourning, acceptance. In the end it comes down to reaching a tipping point of being in a place to deal with the pain of the unknown future over the known pain of the past and present, either way there’s no pain free option when it comes making changes in your life and dealing with the emotional injuries and its legacy. As a therapist I’m glad that our emotional and mental wellbeing is getting more and more attention. Working with a therapist to address issues being experienced allows a fuller life to be lived. Through creating a safe and trusting working relationship where anything and everything can be talked about, without judgement, the problems that have arisen in life can be worked through. 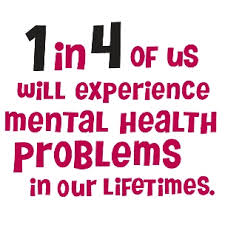 Therapy can be used to deal with the impact of emotional and mental distress caused by current stressful circumstances or historical life experiences such as, anxiety, depression, financial debt, relationship problems, self-esteem difficulties, traumatic experiences and work related issues. If you are interested or know anyone who wants to learn more about how counselling can help please ask them to get in touch. I’m happy to answer any questions. I’m a BACP accredited counsellor / psychotherapist. I work, face to face or online, on a short and long term basis depending on individual needs to help with mental and emotional difficulties. I currently have availability to see clients. 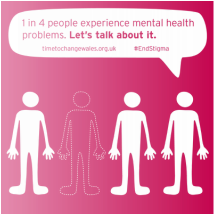 Also, if you are worried about someone you know and are wondering how to have a conversation about it see this link for guidance. As a therapist I’m happy to see the momentum that is gathering around conversations about mental health, particularly in the African and Caribbean communities, and also in wider society. As much as the stigma attached to mental health is being slowly eroded I feel the conversations are very 2 dimensional. Maybe our use of the words mental health is too encompassing and meshed to enable clear understanding to be had about cause and effect. 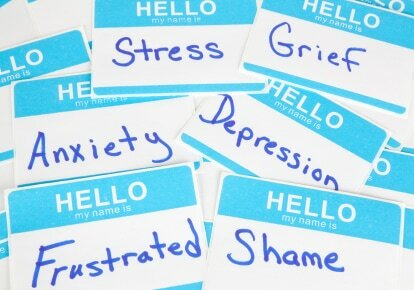 Mental health is used to describe enhancing one’s wellbeing; mental health is used to describe someone being mentally unwell like someone experiencing being run down, having a cold or flu; mental health is used to describe the capacity of cope with everyday stresses; mental health is used to describe someone experiencing mental illness known as psychosis which is at the extreme end of the continuum and requires medical intervention. Mental health is used to describe symptoms without asking what the cause is. ​It’s been a while since my last blog. This one has been floating around for a while now and after a recent discussion I decided to move it from the abstract to concrete. ​Spirituality seems to be the concept that evokes a neutral response however faith and religion like politics can arouse very passionate feelings. Many see it as a source of division whilst for those who are practicing a particular faith it is a huge comforter, inspiration and resilience in the face of life’s challenges. There’s a lot already out there with various studies and reports on the impact role of faith, spirituality and religion on mental health. #Wellbeing - Are you worried about someone? The sharing of this information is long overdue! From conversations I’ve had socially over the years, and an increasing amount of enquiries I’ve been receiving professionally recently has involved people being worried about or seeing a loved one not well. Either through noticing changes in behaviour like loved ones becoming more distant, acting out or clear displays of psychological distress. This can be very distressing in itself due to the feeling of helplessness it can create. Rather than reinventing the wheel I thought it was best to share an article I came across which I feel has put together a good user friendly guide on how to approach the issue and start a conversation sensitively and compassionately. 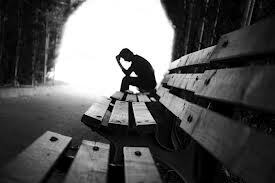 As often the difficulties being experienced create feelings of shame. Often the hardest part of having a mental illness - whether diagnosed or not, is not knowing how to talk about it. Living with a mental illness can be a lonely experience. What if people make judgements? What if it affects employability, or ruins relationships and friendships? While you may not know (or ever know) how this person is feeling inside, you can help them by asking questions and inviting them to talk about how they feel. Even if they're not ready to open up to you, the interest you show in them will help them see that someone is there to listen. In a previous blog looking at factors that enhance our wellbeing, if you are able to work, finding satisfying and fulfilling work or career can play a huge part in how happy you may feel in your life. The article below looks at, among other things finding the right career; making the most of your job if leaving isn't a viable option at the present time and tips on finding the right job/career for you. There's a lot of good tips on the small or big changes that can be made made to make positive changes in your life. Have a read and see what you might identify with and what you may find useful. Feel free to share with people in your life who may benefit from the information. I came across these articles by Pam Gawler-Wright a little while ago and found them very thought provoking. Have a read and think about how many unwritten, unspoken contracts influence your relationships with people or expectations in your life? If you recognise yourself as displaying codependent behaviour in some shape or form then I wonder where on the Karpman's Drama Triangle you are on. 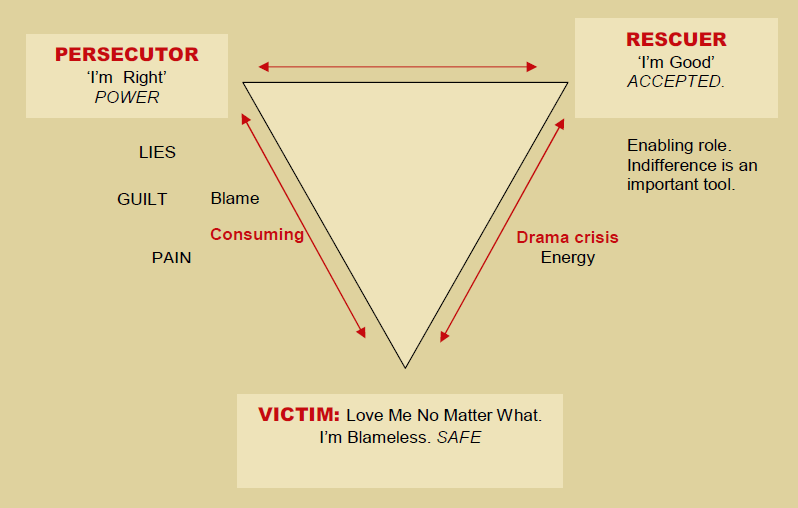 Lynne Forrest's Overview of the Drama Triangle explains and describes the dynamics of the concept very clearly. There's also a good succinct article at ways of breaking the drama triangle.